Playing the pokies is a hobby for some and a profession for others, but for me it was a way of passing the time while I waited for the bartender to bring me a cocktail. I don’t usually frequent the pokies, but that time waster ended up being the most productive thing I did that day. Read on to hear my story about my biggest jackpot pokies win, along with some of the biggest pokies jackpot wins by lucky players online and in land based casinos. Standing near the bar at my local RSL, after ordering an espresso martini I noticed that I was near a large room of pokies. Since my friends were up on the next level and I was separate to where they were I thought I would sit and try my luck while waiting for the bartender to mix up my drink. 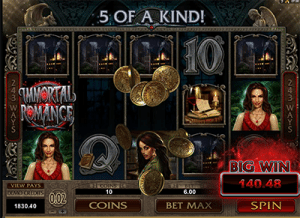 I found a slot machine which had a vampire theme to it, and while I don’t remember what it was exactly called I do remember that it was somewhat similar to the online slot machine Immortal Romance. I pulled out a $10 note, cashed it in for dollar coins and slipped the coins into the slot. My cocktail was cheap so I didn’t mind if i lost this small wager. The machine sucked up my money and I honestly thought I wouldn’t be seeing it come back out, but I did, and in multiple lots. Immortal Romance is quite a popular slot and was created by the top leading software developers Microgaming. The slot I was playing had a 5-reel format, just like Immortal Romance, though I wasn’t sure if it had the 243 ways to win. It has all the similar vampire characters, which made me quite fond of Immortal Romance when I was introduced to it online. I was only new to the pokies back then and to be completely honest I didn’t really know what I was doing. I was just randomly hitting buttons all over the place, hoping that the people near me didn’t know I had no clue. But the reels kept spinning and I landed enough scatters to trigger the bonus feature. Here I was, with no clue as to what was happening and all these new sounds and different images. But interestingly enough, not knowing what I was doing saw me winning more than I have when I did know what I was doing (I think they call it beginners luck). Although I wasn’t quite watching as I was eager to get my drink, I did notice the machine started flashing a bit more and it was making a bit more noise. Now I know they call this the feature round, but back then I had no clue what was going on. Next thing I know the credits up the top of the pokie machine said I had won $500. After calculating how many espresso martinis I could purchase with these winnings I decided it was enough to withdraw rather then keep on playing only to lose it all. The gamble option was there, where you choose to either double your winnings by choosing red or black, or quadruple your winnings by picking the suit, but I didn’t choose to hit the gamble feature. I have known many who have and the risk has sometimes paid off, quite literally. Additionally, this feature is commonly available on Microgaming pokies, so if you do notice the ‘Gamble’ feature it might be a good thrill to have a go but you need to be prepare that if you lose the gamble, you will lose all your initial winnings. While my win wasn’t the biggest win, I hadn’t played for long and therefore it was quite a big win for me. It was also my first ever win on a pokies machine so it was quite a big deal. There have since been some fairly amazing wins, especially online with the progressive jackpots which my team loves to talk about. However, other slots that aren’t progressives also see quite big wins. To show how my big win wasn’t very big in the grand scheme of things, check out some of the truly life changing wins below that have broken pokies records around the world. Breaking the Guinness World Record for the biggest online win on a progressive jackpot pokies game is Jonathon Heywood, a 23 year old ex-soldier from the UK who won the jackpot in October 2015. Jonathon scored himself an epic £13.2 million playing the hugely popular Microgaming progressive jackpot game, Mega Moolah. 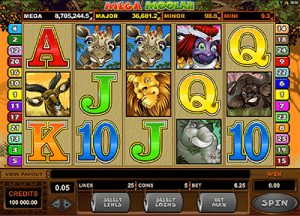 Mega Moolah is responsible for some of the biggest online wins across the globe, with a New Zealand player cashing in $10,144,395.82 in June 2016. Prior to that, the world record holder for biggest win on a slot machine was 47-year-old Finnish man who won almost $23 million (€17,861,813 in his currency) on the Net Entertainment progressive Mega Fortune in 2013. He bet the maximum bet which is $0.25 and managed to score the enormous win. The record was set previously at €11.7m but this win broke it and it actually hasn’t been beaten since. Unfortunately, as of mid-2016 NetEnt no longer offers its largest progressive jackpot pokies to players from restricted countries, but there’s still a decent selection of their smaller progressives available at Slots Million. Many have won quite a big sum of money of these progressive jackpot games as they are connected all around the world and every time a player hits them, no matter where they are located they will be contributing to the total prize pool which can go off at any time, by any player. There are quite a few available online and many with high payout percentage rates meaning you could be a few clicks away from becoming an instant millionaire. This was the biggest win on a slot machine in Las Vegas, mainly because he won twice on the same machine. Elmer Sherwin won $4.6 million on the Megabuck jackpot slot at The Mirage, Las Vegas, on the same day it opened. Since this was in 1989, it would equate to over $7 million now meaning this was quite a big win. Just over 16 year later, Sherwin won again on the same jackpot slot in Las Vegas, but this time he won even more, landing just over $21 million. Generously, he gave a lot of the winnings to victims of Hurricane Katrina, and other charities, meaning most of the winnings went to good causes. Combined, Sherwin is the biggest winner in terms of a slot machine in Vegas. This win would’ve been the biggest win of all time, provided it actually happened. A 26-year-old man living in Austria was spinning the classic fruit machines when he though he had won £37 million. However the casino he had been playing at said it was a software error, and he hadn’t in fact won the millions. They did offer him a free meal and £60 instead of win but we can’t imagine this would’ve sufficed. This error was quite obvious since he only got four symbols out of the five required to hit the jackpot but the machine still told him he had won, so he was obviously quite upset when he was told otherwise. While this didn’t actually happen, if this had indeed been true it would have been the biggest fruit machine win of all time. Additionally, if you do want to win you should stick to playing online as they have much better payout rates of around 94-98% depending on the software provider, while classic slots at pubs, clubs, and RSLs have a payout percentage of around 70-78% meaning big wins are less common. 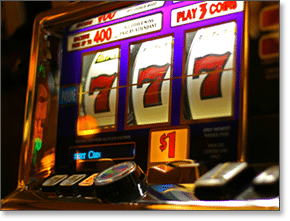 There have been quite a few large wins on the pokies, both online and offline, but it is important to play at a regulated and reputable online casino to ensure you will be paid your winnings and you are playing a fair game in the first place. All of the casinos recommended here at OnlinePokieGame.com are legitimately licensed, protected by online gambling industry watchdogs like eCOGRA and offer a selection of safe deposit and withdrawal methods. Sign up for an account at Raging Bull Casino, our top-rated casino site for players from United States, to get instant-play access to some of the biggest progressive jackpot pokies games, and claim a new player welcome bonus when depositing real money for the first time.